Personally, no matter how great the tool is, I'm just not interested in sharing my identity with sites across the web so that a private company can make a cool buck. And, imho, given that they chose an opt-out strategy instead of an opt-in strategy, it's clear that they're more interested in making this tool appealing for the brands who pay big money than for the users who (generally) don't. I'm somewhat concerned too about a single private interest having so much influence on the entire web ecosystem. Once again I think you have done an amazing job distilling the complexity of this issue down. As a privacy advocate it's still a scary thing for me personally. As someone in the public eye (as you and I are both) it could be a reputation mgmt issue. However we are both technical users. Think of the (literally) millions of people on Facebook who are too busy playing Mafia Wars to notice this privacy change. Those are the people I worry about. The low tech users. I am very interested to see how they use, adapt or even notice these massive changes. Thank you for taking the TIME to look into this and then share what you learned. You continue to show that we must share our understanding, resources, etc. because we are all in this together. Thanks for letting us know where to look to watch our backs! I agree with both comments so far. I changed my privacy settings instantly to opt-out of the newfangled stuff. But there are so many people who don't pay attention. I can't count the times I've seen one friend or another post a status message freaking out about some privacy issue that I've known about for more than 6 months. If they're truly that concerned with their privacy, how can they be so complacent that they don't notice major changes to how their data is used for so long? I don't think it's necessarily only the low tech users who are at risk here - it's also those who are either unobservant or lack the knowledge to see what the changes mean to them. I am friends with a couple of the museum's past interns on Facebook, and I sometimes cringe at what they post, and I do worry about their privacy settings. I'm a marketer, social media enthusiast and follower of emerging technologies. But there is so much about Facebook's approach that makes me uneasy as an individual. Even more, the fact that 100's of my friends and more of the general population have NO context to what's going on in the back end of all this is really troubling. Facebook is taking an interesting and provocative stance to "push" people to openess. But unlike google culture, it's much more based on the technology and business they want to build and less the user utility, user experience or genuine steps to help people understand and have context for the decisions they make. As an uber social media user in my work, client efforts and life I step back and am a bit surprised by my own discomfort and lack of clarity in of all this. That's even more troubling, given if I don't get it, everyday users probably aren't engaged enough to want to know more. They have no real reason to question as Facebook opts to make thier public info a default setting and pokes + prods folks to make more info available in unclear ways. I dunno.. but I'm guessing Facebook aids it's own undoing. And I find myself pulling away from the platform. Mostly because they are in no way a people centered culture that innovates around what human beings want and need and they are losing my trust. They in the end are technologists that are pushing people to use their "gadget". I agree with Dana. Facebook is doing some very sneaky things. Thanks for drawing our attention to them and making it clear how these will affect us. This new setting will make nonprofits even LESS in control of their fans, who now are just their "likers." And not letting them send out messages to remind about events is even worse. DISLIKE! At least on LinkedIn you can still email your group members, send out reminders, and so on, and nothing is "shared" without your permission. This new setting, while making some great opportunities for LOLs at failbook.com, still doesn't add value to the facebook platform. This is why Facebook doesn't get my eyeballs anymore. Thanks for the heads up Beth. This could turn out to add value to FB users, brands, and everyone on the internet. It could also be incredibly evil (see: Stacey's concerns). The trouble I have is similar to Dave's. I think it's really weird that Facebook didn't choose to tell us they're sharing our information without our permission. Is this opt-out tact even legal? Until I know more, I've unchecked the "allow" button. I too just learned about the new setting and unchecked it last night. If I could choose which sites share an action on Facebook I'd be more likely to show my support for a nonprofit ("Barb just registered for Bike to Work Spokane--you can too at www.biketoworkspokane.org") than any of the commercial activities I might engage in online. But it has to be organization-specific, not the blanket approach Facebook appears to have taken. Everything they've changed so far on my settings has been in the direction of opening it first and telling me later. They need to borrow Google's slogan: Don't be evil. Echoing the crowd here with thanks for this post. I am the founder of a small nonprofit, http://5forFairness.org and resist spending a lot of time on our facebook page because they seem to change the rules at will and it is too hard to keep up while staying focussed on our core mission. The categories of "like" or silence (implication:"not liked") is bizarrely thin. No gray areas there. And all this "sharing with friends" business - really, why? Why do my friends need to know - or I need to know - such levels of minutia? It's factoid fast-food and I am pretty sure we're going to learn it's not so good for us. 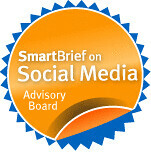 Social network tools that promote information sharing and discussion - LOVE them. But this? What is this? Like you, I have my FB privacy set at the maximum. I want to determine where my personal data will appear on a case-by-case basis. So I have Instant Personalization turned off. And yet I'm considering putting a FB "Like" button on my web site (as you've done). I'm trying to reconcile my desire not to share my likes freely with my desire to have others do the opposite. Whether they call it "like" or "become a fan", the last batch of privacy changes still stand. They are trying to make something that has drastic implications (sharing almost everything about you to the owners of the fan page) LOOK like something trivial (liking a status). This is extremely deceptive. That said, the last few batches of privacy changes have all been deceptive. I really don't understand why they can keep doing this kind of thing. Thanks for your insightful post about Facebook. I believe that privacy, as we have come to know it, is an endangered species. It's a myth if we believe that we have any left. Yet it is a myth I still want to believe in and like you have set my FB privacy settings so that I can control where personal information appears. But as I watch my teenage children and their friends, they have a very different sense of privacy. They don't seem to mind or understand the consequences of putting everything out there for everyone to see. Maybe they are right. Sunlight is a pretty good disinfectant. But then again, some things should remain private. Thanks for this post. I'm about to set up our NPO's first Facebook fan page and was wondering about the latest changes. Of course, once I figure it out -- they'll change it again! It seems that ever since Facebook was launched in 2004 it has tried to stretch the boundaries of personal privacy over and over again. It's hard to keep up with the changing privacy settings. I learned about the "instant personalization" setting last night and immediately switched it off. What's frustrating is that Facebook founder, Mark Zuckerberg, claims that he is only changing Facebook's privacy settings to reflect the current social norms. 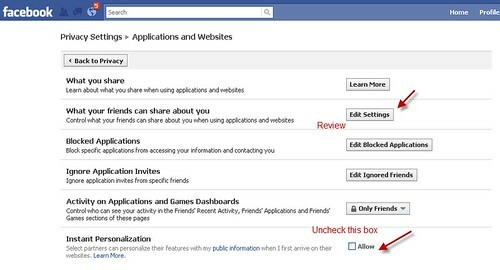 As a Facebook user myself, I don't recall ever requesting less privacy protection. It may be true that privacy is becoming an "endangered species," as Liz said. The Internet alone is a major cause of this, but Facebook is on the verge of making privacy entirely extinct! more, every "Like" you submit ensures Face book (and its partner sites)can deliver a more personalized experience to you. So now Facebook just changed the name of my employer (Feeding America) in my personal profile to a link that is another page. This page has functionality similar to my old fan page at http://facebook.com/feedingamerica. Has anyone figured out how to link those to the existing page that already exists with people that like it? Do I now have to support two communities? I've noticed a new phenomenon with this latest round of privacy changes. My nonprofit organization's Facebook page is actually losing members because users are un-liking fan pages to protect their privacy - or even deleting their accounts entirely.